Growing up, one of my favorite games was Clue. Of course as an eight year old I had no idea what the hell a Conservatory was, why anyone would want to kill Mr. Boddy, or even that a candlestick could be used as a weapon. What intrigued me the most was figuring it all out, eliminating suspects one by one until you eventually identified the culprit. That is the mechanic at the Heart of the game “Oh My Gods!” except instead of investigating a grisly murder, you the player, are attempting to deduce who stole Zeus’s lightning. 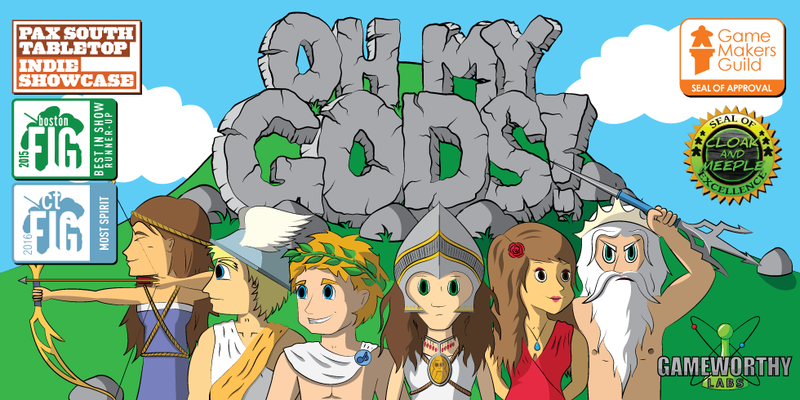 Oh My Gods!, designed by Tim Blank, and published by Gameworthy Labs (www.gameworthylabs.com) is a “perfect storm” type of game, easy to learn, quick to complete, and infinitely replayable (is that even a word? If not, I am copyrighting it). It is designed for three to five players, taking an average of fifteen minutes to complete a round, which is an estimate I found accurate. A typical game starts with putting the requisite amount of suspects in Olympus, either 4 or 5, and then dealing a starting hand of 3-5 cards to each player. Both the suspect pool and starting hand are determined by the amount of players in the game. 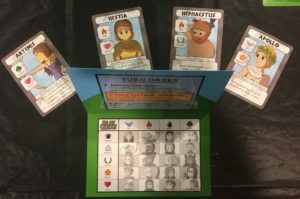 You then take turns engaging in a “Go Fish” style game of eliminating suspects based upon the “elements” or “traits” assigned to each god, which are printed clearly on the game cards. 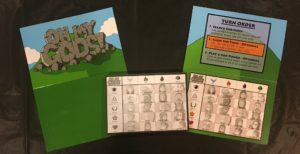 Keeping track of which gods have been vetted is a snap thanks to the enclosed Clue Sheets, and are kept secret from the other players with the aid of a nicely decorated privacy screen. Closeup of both sides of the priviacy screen, and Clue sheets. Throwing a wrinkle into all of this are two distinct mechanics, for starters, the Gods special powers. 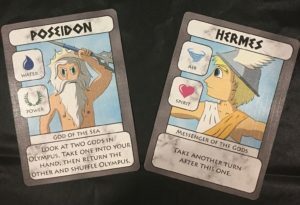 From Poseidon’s ability to allow you a sneak peak into the face down suspect cards, to Hermes’ “take a second turn” power, these single use abilities can be powerful game changers, of course the only way to activate the ability is to remove the card from your hand, and place it face up in front of you, which will reveal that card to everyone at the table, effectively eliminating them from the suspect pool. Secondly Zeus himself will make himself known as he tears a path through Olympus searching for his stolen lightning. 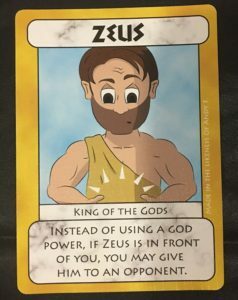 The Zeus card has the nasty habit of destroying your best laid plans if he hangs out in front of you for too long, as many of the other gods cards will only effect the player currently in possession of the Zeus card. 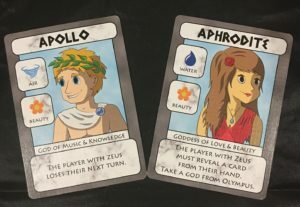 For instance, Aphrodite’s power will force the player with Zeus to reveal a card from their hand, or Apollo’s ability to make the person holding Zeus miss thier next turn. So it behooves you to get rid of him as quickly as possible. The aforementioned Poseidon, and Hermes cards. Note Their element, and Traits prominently displayed on the left side of the card. Also note their special powers in the text box at the bottom. This is Zeus, he wants to ruin your day, get rid of him ASAP!!! And here is why!!! Apollo, and Aphrodite’s abilities can ruin your game if another player drops them on you while you hold Zeus. After a few rounds of eliminating suspects you may have a pretty good feel for who the culprit is, and on your turn, you can most certainly take a stab at it. But beware, if you guess incorrectly, you are out of the remainder of the game, and have to reveal all the cards in your hand to the rest of the table. So being certain is something you should strive for to the best of your ability. In all of the games I played, I never entirely eliminated everyone from contention, but I got to a point where I was between 33-50% sure, and took my chances. A couple of times I was correct, and a couple times I wasn’t. Could I have gone a few more rounds to try and narrow it down a bit more? Sure I could have, but everyone else was getting closer as well, and I had no way of knowing if they were further along than me. So, I rolled the dice, and let the chips fall where they may. It’s that balance of certainty / uncertainty that makes the endgame interesting. 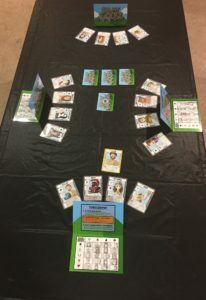 Typical setup for a four player game, the facedown card with the lightning bolt on it is the culprit (center of the table), the other three are the suspects “In Olympus” Each player has a privacy screen and a hand of 4 cards, shown face up for clarity, (normally the other players wouldn’t see your hand). Also of note, player 3 is having a bad day, as he / she is in possession of the Zeus card. Closeup of a typical hand in a 4 player game. I absolutely LOVE this game, and I thank the Supreme Overlord for introducing me to it. As a matter of fact it reminds me of a quote (which I will paraphrase) that renowned video game designer Cliff Blezinsky stated while designing the original Gears Of War: “All games come down to one gameplay hook, and your job as a game developer is to make that hook as interesting as possible for the entirety of the game.” This is where Oh My Gods! succeeds on a high level. It deftly combines elements from the aforementioned “Go-Fish” and “Clue” into its own unique experience that will keep you at the table playing round after round for hours on end. I highly recommend picking this game up, you will most certainly recoup your $24.98 with the hours of enjoyment this game will provide.